Král Ubu, dir. Jindřich Honzl, 1928. 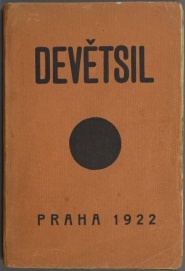 The Devětsil was an association of Czech avant-garde artists, founded in December 1920 in Prague. From 1923 on there was also an active group in Brno. Founded as U. S. Devětsil (Umělecký Svaz Devětsil) [Devětsil Artistic Federation], its name was changed several times. From 1925, it was called the Svaz moderní kultury Devětsil [the Devětsil Union of Modern Culture]. The group was active in organizing the Czech art scene of the period. 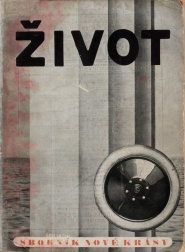 Members published several magazines - ReD (Revue Devětsilu), Disk and Pásmo, as well as almanacs (most importantly Devětsil and Život, 1922) and organized several exhibitions. 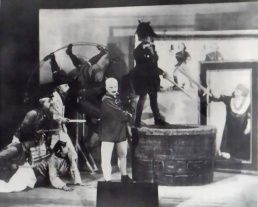 The members included artists, photographers, architects, theoreticans, poets, writers, actors, musicians and film directors, such as Karel Teige, Jaroslav Seifert, Vladislav Vančura, Adolf Hoffmeister, Jindřich Štýrský, Toyen, Jaroslav Rösler, Bedřich Václavek, Konstantin Biebl, Vítězslav Nezval, Jiří Voskovec, Jan Werich, Jindřich Honzl, E.F. Burian, and many others. In 1927 the Brno section discontinued its activities, followed by the Prague section in 1930. Disk 1 (1923). 30 x 21 cm. Download (30 MB). 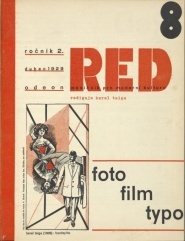 ReD 2:8 (Apr 1929): "Foto Film Typo". Download. 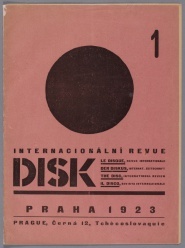 Disk: internacionální revue, 2 issues, eds. Jaromír Krejcar, Jaroslav Seifert and Karel Teige, Prague, 1923-25. ReD: měsíčník pro moderní kulturu, 30 numbers, ed. Karel Teige, Prague, 1927-31. 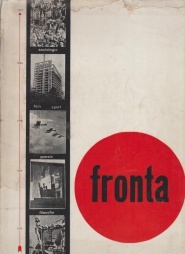 Jaroslav Seifert, Karel Teige (eds. ), Devětsil: Revoluční sborník, Prague, 1922, PDF (150 MB), JPG. Jaromír Krejcar (ed. ), Život: výtvarný sborník, 2, 1922, PDF (225 MB). Halas, Průša, Rossmann, Václavek (eds. ), Fronta: mezinárodní sborník soudobé aktivity, 1927, PDF (344 MB). Jaroslav Seifert, Karel Teige (eds. ), Devětsil: Revoluční sborník, Prague: Večernice, 1922, 208 pp, JPG. Jaromír Krejcar (ed. ), Život: výtvarný sborník, 2, Prague, 1922. Halas, Průša, Rossmann, Václavek (eds. ), Fronta: mezinárodní sborník soudobé aktivity, Brno, 1927, 203 pp. Stěpán Vlašín (ed. ), Avantgarda známá a neznámá, 3: Vrchol a krize poetismu 1925-1928, Prague: Svoboda, 1972.